The plight of Mirza Tahir Hussain has received minimal coverage during Musharraf's visit to Britain this past week. Hussain was involved in an incident with a taxi during which the latter was shot dead. Hussain was initially found guilty of murder, but eventually cleared by the Lahore High Court in Pakistan, citing a lack of evidence. Nonetheless, he was brought before Pakistan's Kafkaesque Federal Shariat Court for the crime of highway robbery, which has jurisdiction in such cases. This court found him guilty of a crime he says he did not commit, for which there was little or no evidence, and for an incident in which Hussain himself had the honesty to drive the dead body of the taxi driver to a police station. Indeed, one of the dissenting judges in the Shariat Court, Abdul Waheed Siddiqui, said that Hussain was "an innocent, raw youth not knowing the mischief and filth in which the police of this country is engrossed" and that the prosecution rested their claims on "conflicting, mutually annihilating" versions. He was set to be executed this past Sunday, but the execution has been delayed because of Ramadan. The IHRC, Fair Trials Abroad, has more on the background, as do Faisal Bodi (from back in May) and Sajjid Karim, MEP for North-West England. There is still time to write to the Pakistani High Commision in Britain. The IHRC has more on how to contact the PHCB. Or use Musharraf's website to let him (or his press secretary) know this is a travesty of justice and he should use his powers under Article 45 of Pakistan's constutition to grant Hussain a pardon (and whilst your there also voice your support for this). What is also apparent in this sorry case, apart from the state of Pakistan's legal system, the corruption of their police force and the refusal of the Dictator to intervene for political purposes, is the damning silence in much of the media in Britain. Hussain is, afterall, a British citizen and a man who, despite not being born in Britain, served in the Territorial Army and was keen to join the regulars. He was willing to die for his country (despite not being born here), but now it seems his country is willing to remain silent and let him die. Imagine, asks Justin Huggler in the Independent, had this case had involved a white 18-year old on a gap-visit. How do you think the whole affair would have been covered? Update (5/10): Pickled Politics, Eteraz, The UK Today, Bloggerheads, Cunningtitle, Blairwatch, NotSausurre and Wolly Days have more. Also see this illustration at Beau Bo D'or. 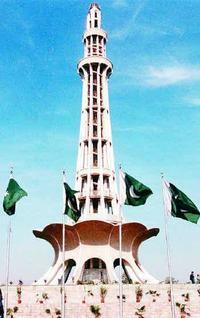 Haroon celebrates Pakistan's 59th birthday and asks what was the point of its creation? Update: Abu Muhammad also reflects on his country's history, quoting the great Pakistani poet Faiz Ahmad Faiz. Update 2: Eteraz adds his views on Pakistan's future. And Watandost gives us a review of two books on Jinnah. We've just driven from Makkah to Medinah in a coach, which by no means is roadworthy (and the air conditioning doesn't work properly). The hajjis I've become friendly with are some doctors from Pakistan, who have been practicing medicine in England for several years. We've been forced to stand outside the pilgrims department in Medinah for a considerable period of time, due to a bureaucratic problem. "Agar ye goron ke haat me ho ta, sab kuch teek chalna ta." He appears to seek approval from me, but I can only smile at the comment. Working offshore has frazzled my brain ('more than usual' comes the cry from the back!). Looking at monitors and the constant motion of the waves is not a good combination. So I've been avoiding computers altogether since returning to terra firma a week ago (and despite sort of promising things, which I'll get around to very soon!). I've been engaging more in human company (siblings and friends), reading books I've not read yet, leafing through books in Waterstone's and Senate House, or wandering around town taking pictures of London, including those bits which aren't that famous. Last week, one such companion was Haroon, who was in London for the week. Over (a lot of) lunch, one point was raised which we both agreed upon: the two national heroes of Pakistan are an oddity; an unexplained paradox (and further that Pakistan only has two national heroes; we mooted the possibility of Imran Khan becoming a third, but then decided he needed to pass onto the next world before he could have any chance of achieving that status, World Cup or not). How is that two individuals like Muhammad Ali Jinnah and Muhammad Iqbal have become so revered by a nation which is largely considered 'conservative' in attitudes towards religious practice and belief? Titles and platitudes are heaped upon these men whose deeds, actions and works went against the grain on many occassions. Not only that, but their legacies are contested by many self-proclaimed intellectual, moral and political heirs. Consider that Jinnah was from a sect considered beyond the pale by many (?) Pakistanis; consider that Iqbal deliberately thought outside or against the paradigms on offer to his religious contemporaries, that he engaged in intellectual and moral 'pohla pahli'. And then consider that to this day, I know that at least one major library (maybe more?) in Pakistan (probably the third largest) still refuses to carry books by a Pakistani scholar, who had to flee his homeland because he said something which was either misunderstood or even objectionable by widespread religious sentiment.